Projects are created and managed in FileMaker Pro, but the communications regarding the project primarily transpire via email. A single project can generate hundreds of email messages with important details about the required re-touch work. The email messages multiply based on the number of projects in queue and it can be hard for everyone to keep up. Get the picture? First and foremost, Gloss needed a way to efficiently organize their electronic communications so they asked us to create an integration between their FileMaker implementation and Slack. Slack, like FileMaker Pro, is designed to streamline workflows. At its very core, Slack is a communication tool, but it can be leveraged in different ways to fulfill different organizational needs, whether it's team building, sharing company resources, or serving as a marketing mechanism. 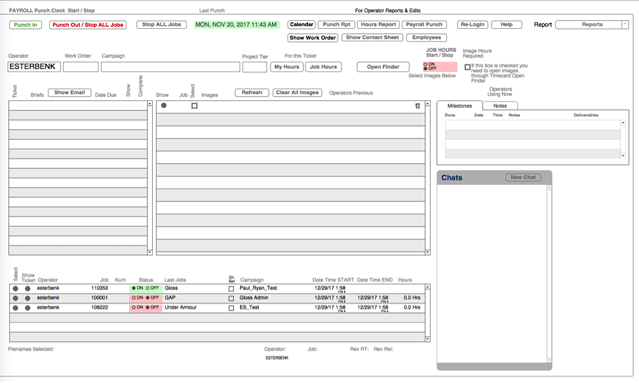 Gloss Studio specifically uses it as a project management tool. 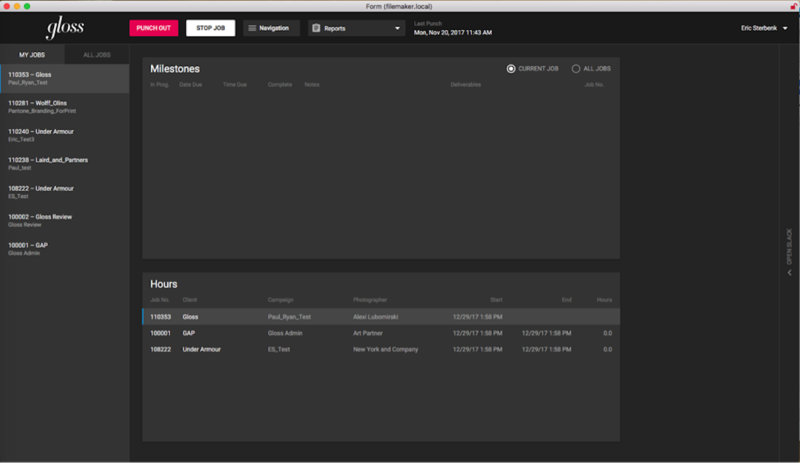 Maintaining FileMaker Pro as the backbone of the operations, Slack was integrated to minimize and enhance the messages between the producers and re-touchers. So when a project is created in FileMaker Pro, a thread is automatically created in Slack. This thread is affectionately known as a Channel in Slack. Not to get overly technical, but using the new JSON functions in FileMaker 16 and a series of scripts is what powers the automatic Channel creation in Slack. Automation and minimal data entry were huge selling points for the system users and a primary reason why they adjusted to the change so quickly. The Support Group has exceeded my expectations on every task I have given them. Not only are they expert FileMaker Developers, but they are true collaborators, working with me to adjust and improve internal business workflow and logic. And so now all of the tasks/messages are neatly organized under a project Channel in Slack as opposed to disjointed email messages. And this creates an easy-to-follow digital paper trail. As an added benefit, producers and re-touchers are only exposed (pun intended) to the projects/channels that are relevant to them. Furthermore, Slack comes loaded with mobile capabilities and works just as well on mobile devices as it does on desktops. The Slack integration led to a solution for another pain point at Gloss, timesheets. Time tracking is a necessary evil in some businesses and Gloss is no exception. The Support Group developers simplified that workflow during this project. By virtue of using Slack, users are able to track their time and milestones more efficiently thanks to the inherent timestamps and organizational flow provided by the tool. In addition, we completely re-skinned their timesheet layout, converting it to a dark-theme layout because let's face it, aesthetics are especially important at Gloss. The new interface is now consistent with Gloss's dark photo editing environment. We also streamlined the layout by removing outdated functionality and strategically restructuring the system so that the interface is clean and intuitive. I guess you can say the difference is like day and night. If you've never used Slack, you may be wondering how it is any different from an email client. Slack users would say the user experience is very different from email. Users have more individual control over how they organize their Channels and by extension, workloads in terms of sorting, searching, setting priorities, etc. The interface is also attractive, familiar and concise. It's features like these that help improve productivity and instill a sense of empowerment among workers. Download a PDF version of this FileMaker Pro customer success story. Read more Customer Success Stories and feel free to contact us to schedule a free initial consultation.